Address leaf (only) bearing four words in Buckingham’s hand, “For my Lord Conway”, with the greater part of Buckingham’s seal in red wax. Docketed “Duke of Buckingham concerning the Ladie Conwey”. With a separate fine engraved portrait (1785) of Buckingham by W.Baillie after Van Dyck, overall 12 x 9 inches. 12 x 8 inches, stained, mounted in a folder from the Enys Collection, with a facsimile of four lines and a signature by Buckingham laid down beneath the address panel. 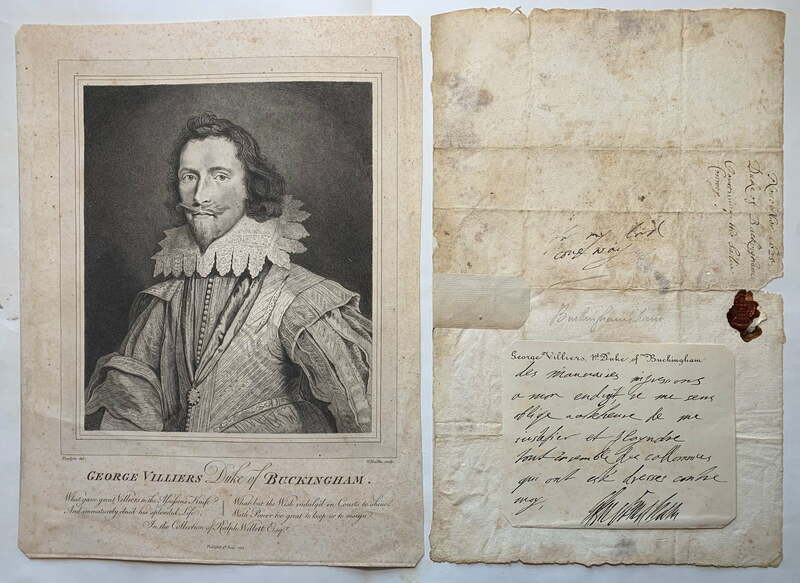 Provenance: Conway Papers (stamp on verso); Enys Collection, Bonhams London, September 2004, Lot 72.. November, 1625. RARE. George Villiers, 1st Duke of Buckingham (1592-1628). Edward Conway, 1st Viscount Conway (1564 -1631), was appointed to the Privy Council in 1622 and made a Secretary of State in January 1623 for five years. This document is a stray from the famous manuscript archive, the Conway Papers (which contained a number of Buckingham letters), now mainly in the British Library and National Archives.